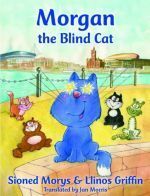 Five endearing stories about Morgan, a blind cat with special powers that enable him to help his fellow cats with their problems. Suitable for readers under 7 years old. An English adaptation of Morgan y Gath Ddall. The stories in this book are about a very special little cat. Morgan is blind, but that doesn’t stop him having adventures. He is very brave, too, especially when he needs to help his family and friends. At those times his eyes shine like two beautiful stars, and he uses his special powers to solve all kinds of problems!